Former two-time NBA All-Star Stephon Marbury is still selling his Starbury shoes in stores in China and online in America starting at $14.98 after originally joining forces with the now-defunct Steve & Barry’s sporting goods store in 2006. If LaVar Ball, father of NBA prospect Lonzo Ball, hopes to get his Big Baller Brand going without the help of the major shoe companies, Marbury could offer some advice. ESPN.com reported that an endorsement deal for former UCLA star guard Lonzo Ball, considered a top-five NBA draft prospect, is not expected with American shoe powers Nike, Under Armour or Adidas because of the demands from his family. Ball averaged 14.6 points, 7.6 rebounds and 6.0 assists for UCLA during his lone college season. LaVar Ball shows some of the Big Ballers Brand apparel currently sold. In his meetings with the three companies, LaVar Ball insisted his upstart Big Baller Brand be licensed from him and also showed the companies a prototype for Lonzo Ball’s first shoe, ESPN.com’s Darren Rovell reported. LaVar Ball has been pushing his Big Baller Brand for months with hopes of landing a $1 billion shoe deal for his family. Lonzo Ball has declared for the 2017 NBA draft, while his younger brothers, LiAngelo and LaMelo, have committed to UCLA. “LaVar Ball wants a billion dollars. There is nothing wrong with saying that is what he wants. It’s how he’s said it,” said Marbury, a China Basketball Association free-agent guard. “If he was able to express why he wanted it and explained it without saying it how he said it, which is his prerogative, he wouldn’t be scaring people. He has three kids who are really good basketball players. He should want to own his own brand. That is the smartest way of doing it. With his son [Lonzo] being a dominant college player and projected to be a high pick in the NBA draft, he will be able to use his capital that he makes to invest in himself, which is the best investment. Marbury talked with The Undefeated about the Big Baller Brand and how NBA superstars could fare if they started their own shoe and apparel companies. Ball has said that he would reach out to Chinese brands. What advice would you give to him? Come rock with us. We know the structure that is needed. We don’t have the capital, but with my brand we have the resources for what is needed from the manufacturing side in China. He doesn’t have to do something with Starbury. We could work together where we can help put them into the position to speak to all the people who have that access to do what they want in China. I’m not saying I want him to come under my umbrella and be with Starbury, but I can position them by setting them up with the people that they need to speak to in order to create their infrastructure if they want to infuse capital into themselves. How hard was it for you to build the Starbury brand? It’s the hardest thing that I’ve ever had to do, but I’ve learned a lot through the whole process of doing this. I realize it takes a lot of effort, work and capital. But you don’t stop doing it. You keep grinding and keep trying to figure out ways you can position yourself to use your brand to leverage it. With Starbury, we’ve identified different sources to get our product out. It’s a difficult part learning all the logistics to set the infrastructure so everything moves smoothly on the platform to be efficient. All of those different ways of doing things are challenging. You have to learn all of these different things, which is something you do when you have your own brand. It’s difficult. But at the same time, it’s worth it. 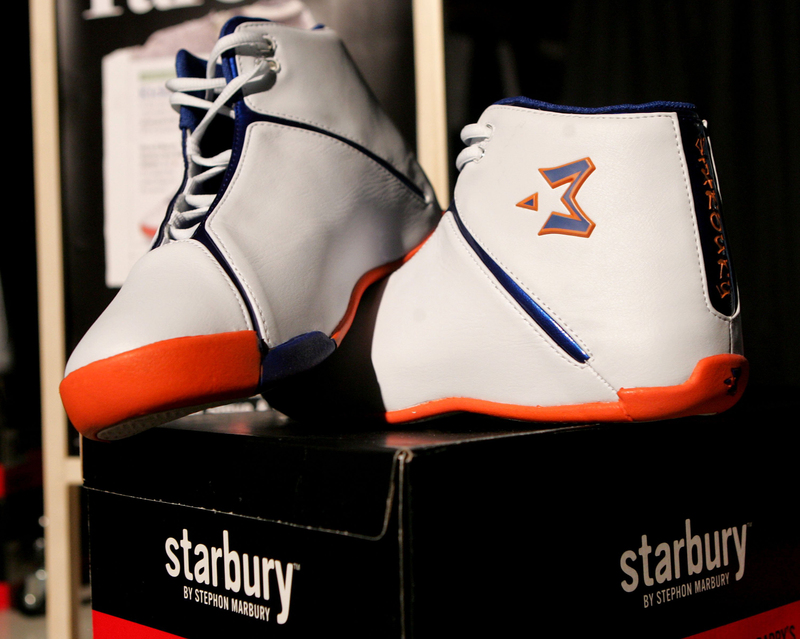 Sneakers from the “Starbury” line by Stephon Marbury sit on display at the Stephen & Barry Store in Herald Square on August 16, 2006 in New York City. Did you expect there to be issues for the Balls considering they declined to use a well-known basketball agent? It’s necessary to have an agent because they can be the buffer and put you in place to have the meeting and express what you want to express. Maybe [the Balls] don’t want to pay them. But pay them a flat fee. You don’t have to pay a marketing fee. It’s all about how you negotiate it. They have three guys that can play basketball. These kids can play. You can’t look at them and say they can’t. They can. For them moving forward, they have to strategically figure out how they want to go about doing it themselves and investing capital on their own to do it. It can grow slow. If [Nike’s] Phil Knight can get to where he got to from selling shoes out of the back of his car, with him being able to make a lot of money by playing in the NBA and all the different platforms out there to sell your product … if [Lonzo] does what he is supposed to do, he becomes his own stock market. Did you ever bring your brand to a major shoe company? After Steve & Barry’s, I didn’t bring my brand to anyone. I just started to try to figure it out on my own because I didn’t want to let it die. When I left the NBA and went to China, that was my opportunity to build a brand the way I wanted to build it, learn what I needed to learn and have the access to the different portals of who makes the product. Coming to China, I’m coming to the [shoe] manufacturer of the world, and this was an opportunity to see what I could come up with and try to continue on doing my brand. Ten, 11 years ago I didn’t know anything about it. I knew about the shoes, what I liked, what I wanted, and that they made shoes in China. I didn’t know the intricate details needed to run a shoe company. It’s super-duper hard. You need a big team, and my team is lean and mean. We’ve all learned how to multitask and do different things. Whereas Nike has departments, we have people. You understand that. With what we want to do and have the world take it, it’s a different movement. It’s not about selling shoes at a high price. We’re trying to get in touch with the feelings of the person and let them know how we feel. Once they understand how we feel and what we’re trying to do and provide them something on Earth at an affordable price forever and give them flavor with it, that’s the attraction. That’s the allure we are trying to get across. You are known for affordable shoes and clothing. The Big Baller Brand T-shirts start at $50, and the hats start at $38 and go up to $100. What do you think of their prices? Some T-shirts at Nike sell for $50. My thing is $50 and down. [LaVar] should be in that range. Are people buying it? That’s the question. If people are buying it, then he has a nice market. He’s covering a lot of tiers. Thirty-eight is affordable and around the price of some of the hats out. The $100 leather cap, he’s probably saying he is paying for the leather. All of the things that he wants are things he can make on his own. All he has to do is infuse capital into it, put a plan and budget together, have a marketing strategy. With social media, the way how it is, he is going to be on every television station for the draft. People are going to watch his whole training process of what he does. That’s all documented. That’s all part of his growth, his movement and what he’s about to create. If they believe they are better and he’s nice, all of that is going to come out and translate to whether people will buy his brand. If he comes in and dominates, if he’s exciting and he did it all by himself, that’s 100 percent profit. If you believe and you trust and you believe you’re nice like that, do that. But you have to be able to back it. 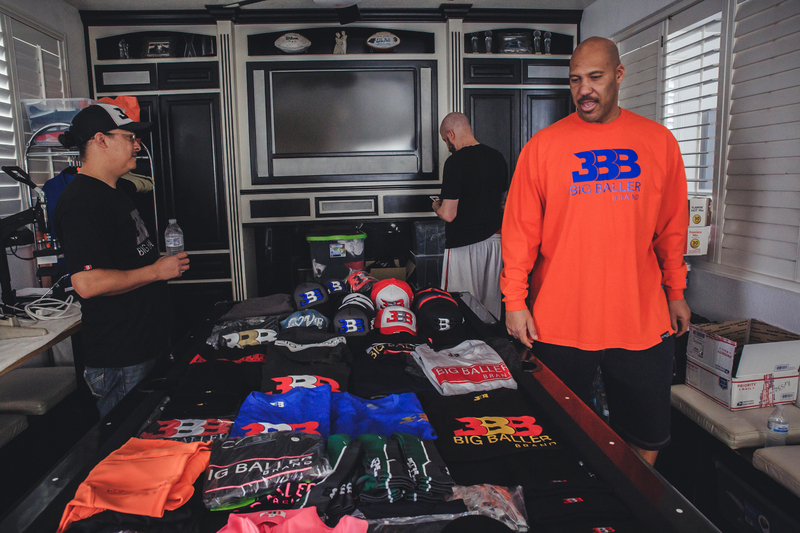 LaVar shows some of the Big Baller Brand gear sitting in his home. Some of this merchandise is even created in-house where he stores various equipment for print screening. If the top stars — LeBron James, James Harden, Russell Westbrook, Kevin Durant and Stephen Curry, etc. — decided to start shoe and clothing brands that they own, how do you think they would do? If LeBron James had his own infrastructure and own platform, he can be like a Nike. When I say own, I mean 51 percent. If he got 51 percent and the other 49 was a company like Nike helping him, forget about it. I’m sure he has to be setting that up. LeBron right now, he’s a parent company, so he can create a lot of tentacles out of him that can be a part of him with what he has done on the basketball court, which is beautiful. It’s a good thing.